The verb “Switch”, in “Switch your TV to the corresponding Component Video input to view your XYZ video playback” is translated in opposite ways by Google Translate and by Bing Translator – and both of them are wrong. Google translates “switch” as if it were “switch on”; Bing as if it were “switch off” – when of course the meaning is neither the former nor the latter. This is just anecdotal evidence, of course, and by itself means little, but it underlines the fact that a machine translation program does not understand the text, and that relying on MT can lead to some disastrous errors. Thought I'd drop you a quick note on this. For MT to work, it needs to be customized per domain and if possible per client and even component. MS and Google are generic MT systems, so their results will fall short of what can be accomplished with more specific systems. There are a couple of open source MT systems that can be customized by the user: Apertium and Moses. I'll present on this in the ATA conference in Boston and be happy to discuss further if you are interested. That said, MT will not replace human translators. Rather, it will be used as a productivity tool. When combined properly with TM, it can give a great boost. By definition, statistical MT systems like those provided by Google and Bing are not meant to understand the text. Hi Anna: Neither statistical nor rule-based MT system understand the text. And that's the whole point. Of course they don't. They are helpful in one way but harmful to quality of translation in the other way..
Because language is full of exceptions and is extremely ambiguous both at the lexical and at the syntactic level, machine will never be able to grasp the nuance. 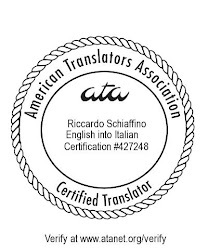 However,when the quality is not main concern machine translation can help us to get the gist of the translated text. So later we can decide if the information is valuable enough to be translated by human translator. Generally I think online dictionaries are very good for word translations. Of course there can always be mistakes in them and MT cannot know in which context the translation has to be made. I also don't think MT will ever replace human translation. However it will become more and important as one of many tools translators will use in future as well.